We are proud to have published and launched ME4Writers’ first collaborative full-length book City without a head, on 8 October 2013. 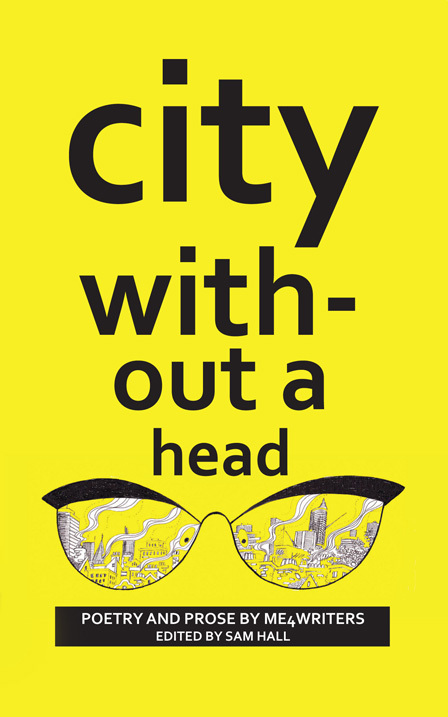 City without a head is a collection of the best writing from a long-running ME4Writers’ project, which you may remember – where we made 8 limited edition fanzines called ‘Encyclopaedia Citaecephale’ and distributed them around Medway and much further afield. Well, nobody could pronounce that name, and we wanted to reflect that this was a new, bigger and better collection, written by a group of regular ME4 contributors, so we changed the name, commissioned some gorgeous artwork from Victoria Wainwright for the cover and 5 illustrations inside, and rewrote, added, deleted and edited what we’d had in the ‘zines. The result is our attempt to define, confuse, capture, expound, tangle, twist, label, and generally riff on life in cities. Writers who feature are Barry Fentiman, Sam Hall, SM Jenkin, Anne-Marie Jordan, Sarah March, Tara Moyle and Roy Smith. Entries range from story fragments, poems, faux-definitions, found writing to short stories. It is our unique sideways look at life in cities. we hope you enjoy it. We hope this will be the first book of many. It can be purchased from www.wordsmithery.info for £12 + P+P. 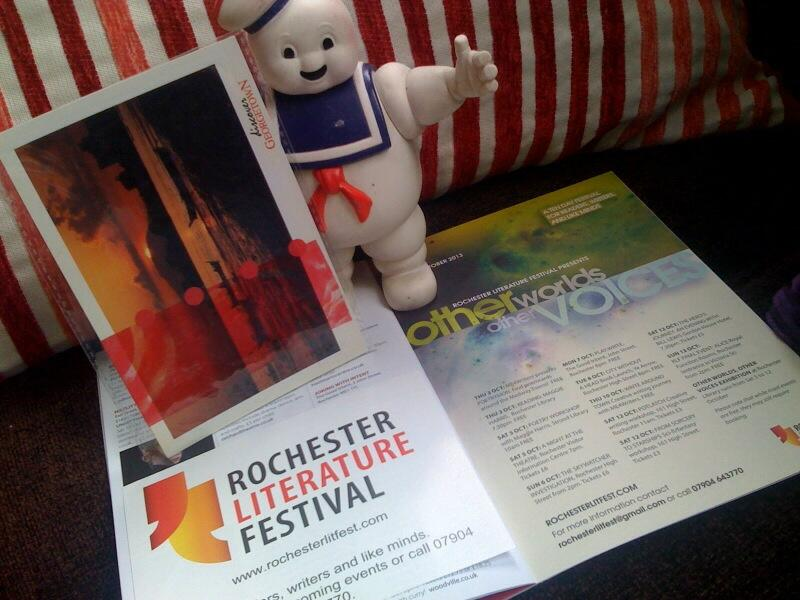 Thanks for a fantastic Rochester Literature Festival! What a busy 10 days we had at the start of October, when ME4Writers were happy to be part of the first Rochester Literature Festival. We started the week on 3 October (National Poetry Day) with Poetrymon – our poetry treasure hunt game. (Picture shows one poem, found in coFWD.) We hid unique, original poem cards around Medway and left cryptic clues online for readers to follow. What we love about Poetrymon is the fact that most of the time we don’t know who finds the cards, (and in fact, sometimes we hope they will be a bit baffled,) but our main hope is that they enjoy the poetry! You can see more about the poets on our Poetrymon page. On 5 October, Sam produced a theatre show as part of ‘A night at the theatre’. She Writes: What’s through the door? 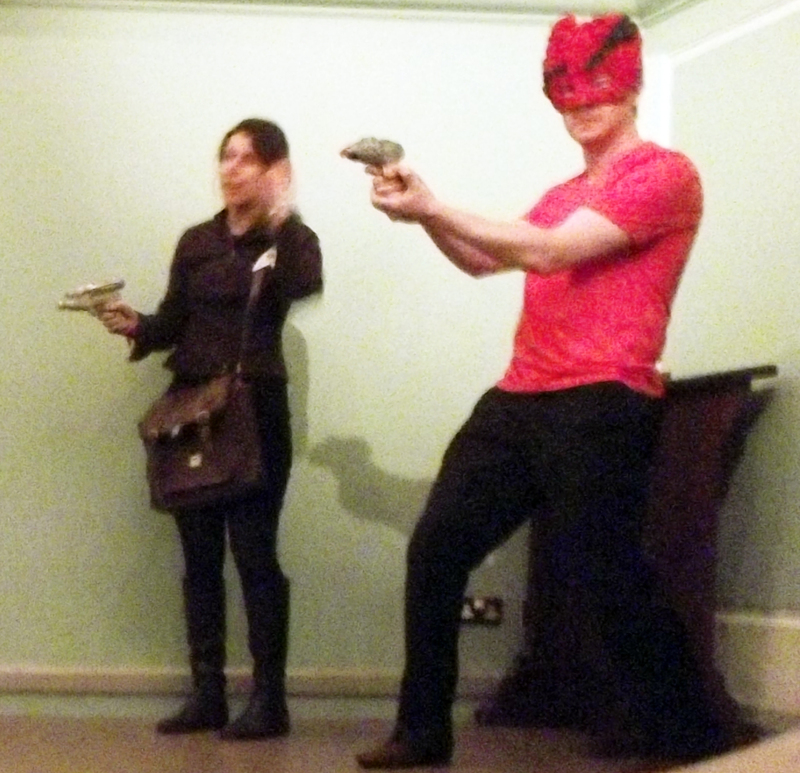 was a performance of 17Percent’s 4-star rated set of short plays based on a story by HG Wells. The plays, written by Whoop’n’wail, Sam Hall and Sarah Hehir, all have a sci-fi/surreal bent to them and invite the audience to explore other worlds – which fitted in fantastically with the festival’s theme. 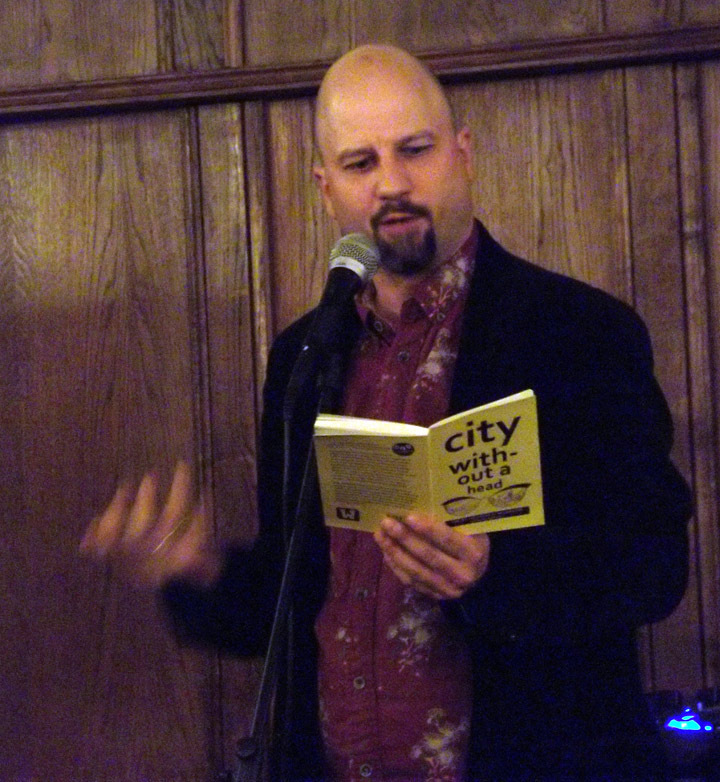 Our next event was the launch of our book on 8 October – City Without a Head – an anthology of poetry, prose and found literature, initially published over two years as a free fanzine. The collection refined, added and developed the ideas in our initial City Project (aka Encyclopaedia Citaecephale), and is published in a limited edition of 200 with gorgeous illustrations by award-winning artist Victoria Wainwright,(available from www.wordsmithery.info). We played readings bingo, randomly generated readings chosen by the audience, ate sweets and listened to music with a city theme by the brilliant 3D. Our final event of the Festival was our walking/writing tour of Rochester on 10 October – Write Around Town. 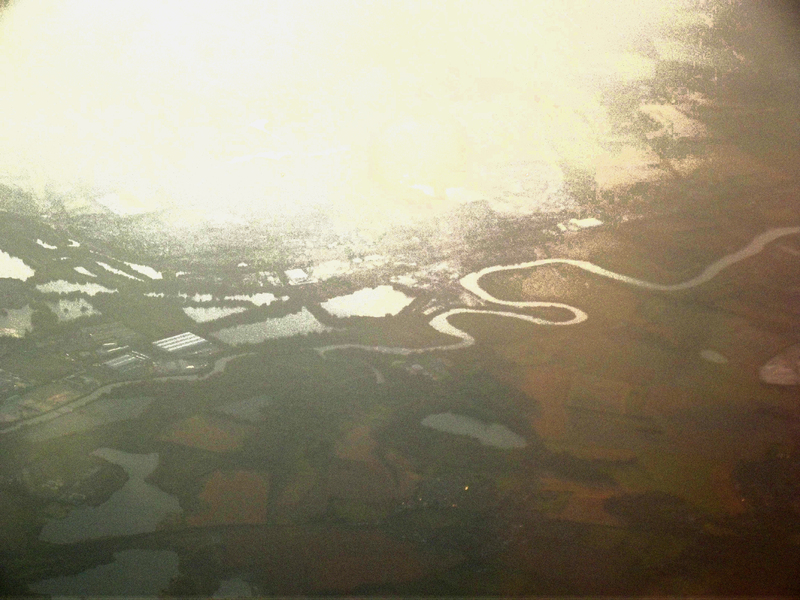 Through a series of locally themed writing exercises, we asked writers to do the thing that ME4Writers seem to be obsessed by: looking at our locality from a different angle. Thanks to Rochester Literature Festival for a fantastic first festival. In case you haven’t played Poetrymon before – here is some info about it. Poetrymon was invented for National Poetry Day 2011 by Sam Hall. It is an interactive treasure hunt game played around Medway, where the prizes are unique handmade poem cards. The cards will be hidden by ME4Writers in a variety of places in Medway and we will post clues on this website and also Tweet and put them on Facebook (join ME4Writers group to follow on FB). The clues will be live from 12 o’clock lunchtime on 3 October. On National Poetry Day (Thursday 3 October) you will be able to follow the clues to find our unique poetry cards. The clues will only be online from 12 o’clock lunchtime on that day on a tab of this site called Poetrymon13. You can also follow clues on Twitter if you follow @the7thtraveller, or on Facebook if you join our group (ME4Writers). We have a system of initials for identifying the author of your poem. If you would like to hear/see more work by the writers below – they are also taking part in some ME4Writers’ events for the RLF (see links for more). MD: Maggie Drury is an unrelenting writer. Her play NOT KNOWING WHO WE ARE was performed at the Blue Elephant Theatre, Camberwell in 2007. She is currently working on a novel and a full-length play. BF: Barry Fentiman is a Medway-based poet and mythogeographer who performs around the South East. His writing has been published in The Medway Broadside, The Irish Post, Stories from songs, The Seed Catalogue and City without a head. Barry is also involved in running ME4’s other literary projects for the RLF. He will be co-running the Write Around Town workshop (10 October), and co-hosting the launch of City without a head (8 October). HS: Sarah Hehir teaches English, Drama and Creative Writing in schools and prisons. She was shortlisted for The Nick Darke award 2012 is the winner of The 2013 Writer’s Prize sponsored by the BBC Writersroom. Her play BANG UP was broadcast on Radio Four on 8 August 2013. Sarah’s play THE FOURTH CIRCLE forms part of She Writes ‘A night at the theatre’ and also her radio play will be read as part of the evening on 5 October. SMJ: SM Jenkin is former chair of the Medway Mermaids, and has had work published in several anthologies including The Mermaid, Medway Festival Fringe, the Medway Messenger, and in publications including Touchstone, Blithe Spirit, and City without a head. SM’s short plays have been performed at She Writes, and the Lounge on the Farm festival 2012. AMJ: Anne-Marie Jordan is the former treasurer of the Medway Mermaids, she has had work published in several anthologies including The Mermaid, Sea Shanties and Siren Songs, Hauntings, and collections including Did I Tell You? 131 poems for Children in Need, The Seed Catalogue, City without a head and Not Only The Dark. PK: Philip Kane is an award-winning writer, storyteller and artist. He is a native of the Medway Towns and the area provides a setting for much of his work. A founding member of the London Surrealist Group, over the past 30 years he has built up an international reputation, publishing and exhibiting in a number of countries including Spain and the USA. We are delighted to be using some of Phil’s poems from his collection Unauthorised Person published by Cultured LLama. and the past, which is a foreign country. See you soon! Happy hunting!